Life Span: 1-2 years Full Grown Size: 1.75"
The Red Cherry Shrimp is the red color variation of the wild Neocaridina heteropoda. This color variation was originally bred in Germany and started to appear in The United States in the late 1990's. It is without a doubt the most popular shrimp in the hobby. We recomend this shrimp to anyone who is just starting into the hobby for its ease on water parameters and high breeding rate. 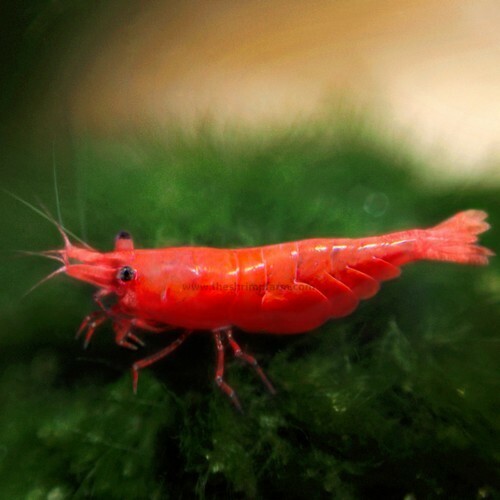 What makes this shrimp different from a normal cherry shrimp is its level of "grade" meaning it has been selectivly bred to be a very vibrant color of red. The Cherry Red Shrimp is an undemanding shrimp in its care requirements. They should be kept in a well established aquarium with no predators. The most important factor for water parameter is stability. And as long as none of the water parameters are in the extremes, Red Cherry Shrimp should be happy and healthy. Want to know how to get even redder red shrimps? This aquarium freshwater shrimp is an Omnivore. They are decent algae eaters, and if sufficient algae is not present, foods intended for aquarium fish and invertebrates can be used to supplement their diet. Another great supplement is blanched (boiled until soft) vegetables. If a male and a female are present in a well cared for aquarium, the Cherry Shrimp will breed. Females are larger and much more colorful, males are smaller and display a clear coloration with red spots. When the female is mature she will often times display a saddle (as seen in the insert). The saddle is the eggs developing in the females ovaries. Cherry Shrimp are very non-aggressive. They spend most of the day grazing on plants, gravel and any other tank decorations for algae and other types of foods. Red Cherry Shrimp will get along very well with any other type of dwarf shrimp that is non-aggressive. When the Red Cherry Shrimp is kept in an aquarium that has no predators, they are very active and only hide after molting (shedding exoskeleton to enable growth).